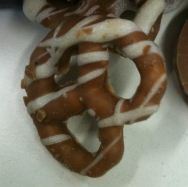 As I once again put these chocolate covered pretzels beyond reach, I have to admit they are addictive. They are sweet but savour, salty but sweet. They are unlike anything. I can’t even compare them to something like chocolate covered popcorn as they are just different. The chocolate is certainly not couverture chocolate but it is delicious. The chocolate is very sweet and the chocolate I had seemed to be starting to separate slightly but such is life in chocolate. When you bite in to one, you get immediate sweet, then savoury then sometimes I got salt all as quite distinct flavours. It sounds weird but trust me it works. 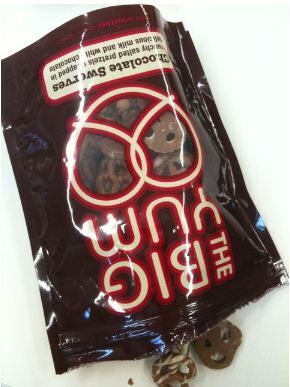 The whole office will attest to the fact that it doesn’t just work, it is an addictive, more-ish snack. For you top quality chocolate aficionados who require chocolate to activate your whole mouth, evaluate based on conch time, bean origin and number of detectable flavours, this likely isn’t the snack for you. I love a good, high quality chocolate and after eating it for awhile, I know it makes it difficult to enjoy the other stuff but I did enjoy this so you can pass the bowl down to the rest of us and we’ll have your share (in moderation)!